So, is management by fact a bit simplistic? What about the emotional aspects of work; trust, appreciation, excitement, fear, worry, concern? How can these things be properly addressed. A lot of these things will be more or less important depending on how we see the world. And most people see the world differently to everyone else! 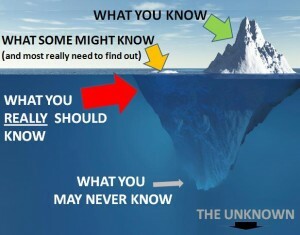 * A start point is to understand that there are things that most of us know – obvious, like the peak of an iceberg. *Next there are the flatter ice floes, which a good ‘spotter’ on a ship might notice bobbing in the waterline. It is important that we know about these and we should get better at spotting them. * However there is also sub-surface ice (in this analogy) – things not visible to anyone but which we need to delve into or at least give consideration (we have a decent hunch – or ‘belief’ – or ‘theory’ – or experience – that they will be there). Effort is needed either to seek them out or at least think properly about how we might have to deal with them. If we blindly sail through areas were sub-surface ice may be lurking, on the assumption that what we don’t know will not hurt us, we would be a little foolish. 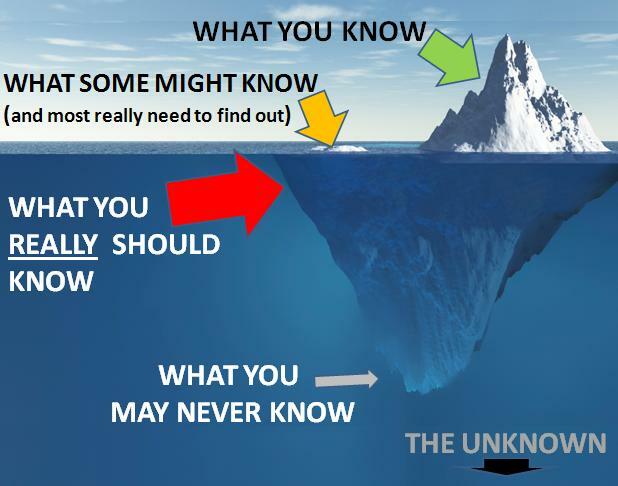 * There is also stuff that we don’t know … and need never know… it is out of our sphere of influence and we cannot do much to manage it – so don’t worry. In summary we should seek reasonable knowledge when we make decisions; we should not ignore things which are too difficult to understand and we should be honest when we are making assumptions. If we do this, then the outcomes of change, whether good or bad, will be better understood and will help to inform us in the future. If we need to broach sensitive subjects: trust, appreciation, excitement, fear, worry, concern, then a conversation is a good start point.